Strengthen your inner balance with a unique energy exercise called The Spiral Sweep. Explore the connection between the endocrine system and the chakras. The benefits are unlimited as we take responsibility for our own evolution and learn to hold and express the greater charges of our being. 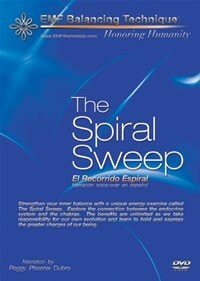 The Spiral Sweep exercise is a small but important part of the information contained in the complete EMF Balancing Technique® system. Responding to the energy patterns of The Spiral Sweep builds strength, resiliency, and increases the awareness of your own energy patterns and the energy patterns of your surroundings. As many of us are realizing, the sacred event we have been searching for is right in front of us, our very own lives. The Spiral Sweep exercise prepares us for the greater energetic charges we are now capable of holding and using in this everyday life. He has been nominated four times for the prestigious "Felix" award (French equivalent to the Grammy), and quickly became Canada's best-selling New Age artist. In 1995 he released The Silent Path, which almost instantly became number 1 in Canada and France.